I hope your holidays are moving along nicely and you have found some time for yourself to do a little stitching. I am almost finished Christmas shopping, but haven't even started wrapping anything. Ugg! Thankfully, my college student loves to wrap! Our two trunk shows for December are nearing the end of their time at the shop. Patti Mann and Julia Needleworks will both be here thru the 27th of December. January brings in Brenda Stofft and Pippin. These two designers will definitely allow for some great new projects to be started in the new year. We will be posting pictures on Facebook as soon as everything is checked in so take a peek after January 3rd. Please drop in for open stitching any time! The staff and I enjoy having the back table full of Stitchers. If you have a friend who does a different type of handcraft (knitting, crochet, cross stitch etc.) bring them along too. We love to see it all and watch how each individual piece comes to life. This weeks Garden Special is a tribute to the new "Star Wars" movie. 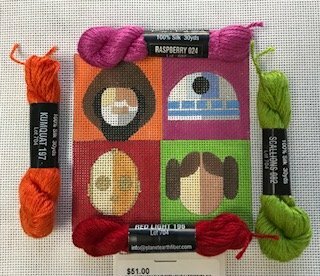 I haven't made it to the theater yet, but this "Star Wars" movie coaster by Melissa Prince would work up quick for any new fan you might have. The canvas and threads shown are at a special price of $60. Give us a call if you are interested.